Here’s an illustration I used for a “Gap” employee newsletter a couple of years back. 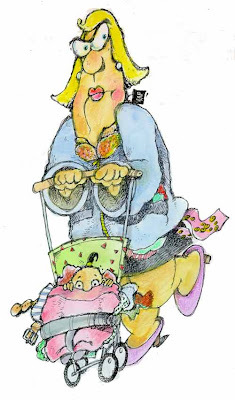 It was drawn for a campaign to watch out for those mothers with strollers during the holiday season. I thought it would also be good for this week’s IF topic “hide”. Notice the clothing tag hanging out the sneaky mom’s coat. Poor little baby! They both look bundled up with all the extra clothing. Great illustration and excellent expressions! With a Mom like that, I feel sorry for that cute little baby. how cool is it that Gap uses original illos for their employee newsletter! Love the poor baby’s expression!! The poor little thing look worry! !